What Mom & Dad Should Know When Your Child Needs An MRI. You’ve just learned that your child’s doctor recommends an MRI. Whether it’s a baseball injury, a concussion, a neurological concern or another condition, every parent wants the same thing – to ensure their child’s safety and speedy recovery. While your doctor will go over the specifics of the exam and what to expect, there are some tips that can just help make the process easier and less stressful. Shields Health Care Group, the experts in MRI, share information and tips on how to prepare your little one for an MRI. An MRI does not use radiation. One of the most common misconceptions about an MRI is that it is a “giant x-ray”. It is actually very different. An MRI doesn’t touch you and you do not feel anything. It uses large magnets, radio waves and a computer to take extremely detailed pictures of the inside of the body, but does NOT use radiation. You can feel confident that an MRI at Shields is safe, non-invasive and painless. Not all MRIS are same - in price or quality. If you are on a high-deductible plan or are concerned with the price of an MRI, utilizing Shields facilities can save money withouth compromising quality. On average, Shields can save $500-$1,000 per MRI compared to Massachusetts academic teaching hospitals in Boston or in surround communities. You also want to consider the type of MRI machine being used. The gold standard for imaging today is 1.5T or above. Shields uses only 1.5T or 3.0T machines - never lower because it can compromise the quality of image and therefore affect diagnosis. You can stay with your child in the room. Shields MRI always strongly encourages parents/caregivers to stay with their child throughout the procedure to alleviate any anxiety for both the child and the parent. We will screen the accompanying adult to ensure that they do not have any metal or conditions that would make it unsafe for them to be in the room. If there is some safety issue preventing the parent from accompanying the child, an experienced and sensitive Shields staff member will stand in. Sedation is not always needed. 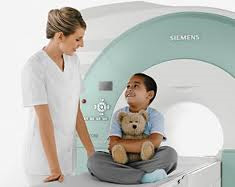 Shields MRI has scanned children as young as four and five years old without sedation due largely in part to having the parent by their side throughout the exam. We also take care to explain every step of the procedure, the importance of staying still and what they should expect throughout the exam. If sedation is needed or you choose sedation for your child, you are with your child before they are put to sleep and are the first face they see when they wake up. Always request a wide, open-bore machine. The large width of an open-bore scanner provides more room for a child to feel comfortable, and most importantly, the ability for the parent to stay closer to the child. You can hold your child’s hand the entire time if that helps! Shields has more wide, open-bore MRI machines throughout the state than any other MRI provider. Bring your child’s favorite stuffed animal. Having a favorite toy/doll can help a child feel at ease and you are encouraged to bring along a furry friend. However, the toy will also have to be screened to ensure there are no metal parts before they go into the machine. Ask for a tour of the facility before your appointment. Most children have never experienced an MRI before and don’t know what to expect. Shields will gladly tour you and your child to show the facility and walk through the sequence of events. They can even watch another patient being scanned! Giving your child the information they need to prepare for the exam makes a huge difference. Begin preparing your child about 1-3 days in advance. Talk to them about why the doctor is taking pictures and use simple words to describe what they may experience. For example, “There is a big, special camera taking pictures of the inside of your body. It makes some loud noises, but it doesn’t touch you and it won’t hurt.” Let your child know that they need to stay very still so the pictures are not blurry and help them practice in advance by standing very still. Finally, reassure your child that you will be close by the whole time.